The municipality of Niğde (200,044 inhabitants in 2012, 118,186 in the town proper; 23,030 ha) is located in central Anatolia. The flag of Niğde (photo) is white with the municipality's emblem. "Belediyesi" means "Municipality". The motto means something like "The town of living civilizations". The emblem of the municipality features the I-shaped town's clock tower. Located inside the castle, the Ottoman clock tower is one of a number erected in 1902 to celebrate the 25th year of Sultan Abdülhamid II's reign. 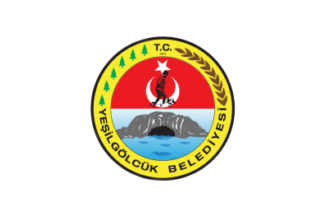 The flag of Yeşilgölcük (photo) is white with the municipality's emblem. "Belediyesi" means "Municipality". ÖHÜ was established in 1992 as Niğde University. It was renamed in 2016 in honor of Infantry Sergent Major Ömer Halisdemir (1974-2016). During the aborted coup of 16 July 2016, Halisdemir prevented the capture of the headquarters of the Special Forces Command in Ankara by killing Brigadier General Semih Terzi, who commanded the assault, and was killed by the plotters. The flag of ÖHÜ (photo, photo, photo, photo, photo, photo, photo, photo, photo) is white with the university's emblem in the center. The flag of Niğde University (photo, photo) was similar, with appropriate writing. Niğde Belediyespor (Niğde Belediye Spor Kulübü) was established in 1990. The flag of Niğde Belediyespor (photo, photo) is white with the club's emblem in the middle. Managed by the municipality, the club uses the same design for "Niğde" as on the municipal flag, letter "i" being replaced by the town's clockwork.